I don’t think I’ve mentioned this relationship before. Chesley Taylor, brother of both Spicy Taylor Pryor and Massey Taylor Pryor served in the same regiment (3 REG’T (DICKINSON’S) VIRGINIA MILITIA) during the War of 1812 with a John Pryor. I suspect this is John Pryor who was married to Massey Taylor. They married in December 1812 — perhaps it was spurred by the beginning of the war. Isaac Crews – he married Mary/Polly Oglesby the widow of Hezekiah Taylor who was killed in the War of 1812 in Canada (related to Edmund Taylor, but not his son Hezekiah Taylor who lived to a ripe old age in TN). Isaac Crews was counted on the 1820 Census in Campbell County, VA on the same page with with Edmund Taylor and his son Hezekiah. Working through some older items I’ve meant to post. Two more letters regarding the War of 1812 land warrant for Brazure W. Pryor– the Hero of Hampton. In making an investigation I find further sum for your deceased husband Brazure W Pryor in the War of 1812 which in my opinion will give you an additional land warrant. With your permission I will endevor to get you another warrant. In that evente you will please say that the 80 acre warrant No 36.536 which issued to you has long since been sold out of your possession in the acknowledgment of this letter. Brazure W Pryor was pay master to 115th Regt VA Mi (Militia?) from 28 Jul 1814 to 26 Feb 1815. X Received of Mr. John K. Martin, 56 dollars clear of all expenses for the services of my deceased husband B. W. Pryor, during the War of 1812. PS should the money be applied for, do not pay in ??? a written order from me. When I was looking at Pryors in the War of 1812 I wanted to see who served with John H Pryor, Samuel T Pryor, and William Pryor in 8th Reg’t (Wall’s) Virginia Militia. So I Googled. This is a reconstructed list of this regiment. The Pryors in this regiment were sons of William Pryor and Elizabeth Hughes. They were all from Goochland County, VA. Samuel Thornton Pryor was born about 1791 and was on the 1850 and 1860 Census in that county. He married Lucy Hunter and she claimed a widow’s pension for his service in the War of 1812. John Hughes Pryor married Sarah Smith and first moved to Williamson County, TN and then settled in Rutherford County, TN. I didn’t have any information on their brother William Pryor, however I found that Louisa Jane Pryor filed for a widow’s pension based on the service of William Pryor in 8th Reg’t (Wall’s ) Virginia Militia, so we may have his wife’s name! 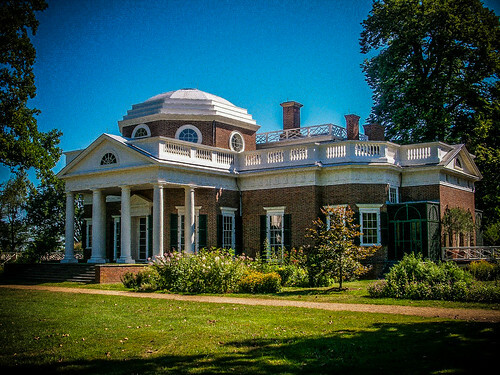 OK, I admit sometimes I drool over Thomas Jefferson like he was a rock star. But isn’t it fun when you can tie family research with one of the Founding Fathers? The National Archives has been putting Founding Fathers documents online. Hazzah! Double Hazzah!… the website is cross referenced so when you find one thing you easily find more. Oh yea, this is a history junkie’s dream!